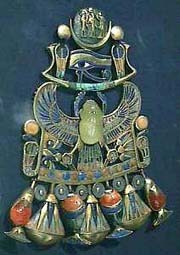 de Lubicz's research was followed up on during the 1980s by the maverick Egyptologist John Anthony West, who had teamed up with a professional geologist named Robert Schoch of Boston University with the express purpose of putting de Lubicz's conclusions to the test. 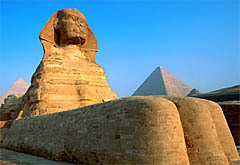 From their research West and Schoch made an Emmy award-winning video, The Mystery of the Sphinx, which made its debut on NBC in 1993. 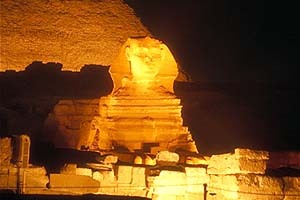 In that video, West and Schoch proved conclusively that de Lubicz's theories regarding the true age of the Sphinx were accurate. Schoch, a professional geologist, carefully studied the erosion patterns that are especially prominent on the hindquarters of the Sphinx and on the walls of the Sphinx enclosure, and stated definitively that it musthave been the result of centuries of rainfall beating down on the limestone, as that is the only way that the sort of undulating, vertical grooves and channels found there could have been created. Furthermore, the depth of the erosion could only have been created as the result of water running down over the surface of the limestone over a period of hundreds or even thousands of years. 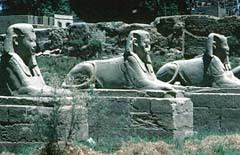 Thus, it is entirely possible that the Sphinx may be not only much older than the usual date of 2500 b.c., but it may actually predate even the Great Flood — which most likely occurred around 10,000 b.c. — by thousands of years. Next in importance to the geologic evidence for the great antiquity of the Sphinx is what could be referred to as the "aesthetic" evidence. We have seen that the Sphinx exhibits an extreme level of wind and water erosion on its body, the head appearing to have been affected the most. However, few seem to notice that the head is proportionally far too small for the body — so small, in fact, that it is less than half the size it should be compared to that of a lion, the model upon which all other sphinx sculptures were based. This is unlikely to have been purposeful, as all the other sphinx sculptures that that have been found in Egypt — all of them — have heads that are proportional to their bodies. Therefore, the most logical conclusion is that the head was originally much larger but, due to extreme erosion, it has been recarved at least once. 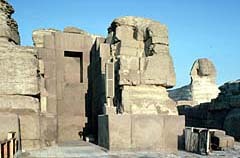 In conclusion, between the water erosion to be found on and around the Sphinx, the apparent recarving of the head of the Sphinx due to extreme levels of erosion over many thousands of years, and the fact that the materials cut out from around the Sphinx were used as building materials for a temple whose architectural style greatly predates that of Egypt's dynastic period, the evidence appears to strongly suggest that the Sphinx may indeed be much older than currently believed — possibly old enough to be an archaeological remnant of the world before the Flood. The huge trilithons of the Valley Temple are simply two massive blocks surmounted by a third massive block — literally, the simplest possible method of construction. At hundreds of tons each, however, the question remains as to how they were lifted into place, as it would be difficult or impossible to perform the same feat today. Image from The Oriental Institute. We are told that all of the wicked world from before the Flood was destroyed. Unfortunately, that appears to not be the case — much of the antediluvian world appears to have escaped the cleansing destruction that was inflicted upon it. The megalithic architecture to be found around the world is almost certainly from the world before the Flood, from a time when the technology to lift massive objects with relative ease was apparently widely available. Some also believe that radio, television, electricity and similarly high technologies were also available, and were linked to some of these megalithic structures. And of all these structures, the Great Pyramid appears to have been the greatest — and most dangerous — megalithic remnant of the antediluvian world. Some believe that the Great Pyramid lay at the heart of the civilization of the antediluvian Egyptians not as an object of worship and veneration, but as the central piece of a gigantic power plant — the "Giza Power Plant" — that generated electricity and other forms of power that were used not only for communications and power generation for peaceful use, but also as a weapon of terrible destruction. As such, the antediluvian Egyptians were in possession of a technology that, until the twentieth century, far exceeded our own. Interestingly, early radio sets used crystal radio technology, before vacuum tubes, solid-statetransistors and other methods were developed during a long history of development. 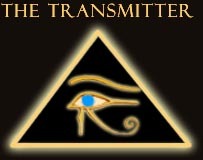 If the antediluvian Egyptians had discovered radio, it stands to reason that television was not far behind. There has always been something about the Great Pyramid of Giza that has excited the imagination of men more than any other pyramid in the world. 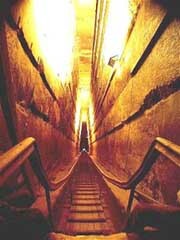 Though this so-called "Pyramid of Khufu" is nearly identical in size to its twin, the so-called "Pyramid of Khafre", it has excited the imagination so much more because deep within its dark interior lies a mysterious series of rooms and passagewayswhose true purpose has long remained a mystery. 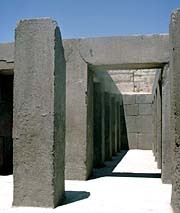 Moreover, these passageways exhibit such a high level of precision in their manufacture that even today we would be sorely pressed to reproduce them. Though mainstream Egyptologists are adamant that the Great Pyramid was meant to serve as a tomb for Pharaoh Khufu, like all the other antediluvian megalithic ruins we have discussed, theGreat Pyramid has absolutely no inscriptions inside or outside, funereal or otherwise. This is wholly different from every other Egyptian tomb ever found, which invariably have practically every square inch of wall, and even ceiling, covered in beautiful inscriptions and paintings. Moreover, not a single artifact, relic, sarcophagus or treasure of any kind has ever been found inside the Great Pyramid, even by the Egyptian Caliph Al-Mamoun, who was the first to enter the interior workings of the Great Pyramid since it was sealed ages ago. Yet, despite the complete lack of evidence for the Great Pyramid being a tomb, temple or memorial of any kind, Egyptologists continue to insist that the Great Pyramid was indeed the tomb of Pharaoh Khufu. This is based on a single, highly dubious bit of graffiti that had been found in the formerly sealed "relieving chambers" above the so-called "King's Chamber" in 1837. This graffiti was found by one Howard Vyse, the 19th century Egyptologist, who claimed that the hieroglyphics, that were crudely daubed in red paint, spelled out the name of Khufu and were therefore proof that Khufu had built the Great Pyramid. Beyond the obvious question as to why this tiny, insignificant mark in an area sealed off from human contact was the only identifying mark in the entire pyramid, is the questions about the provenance of the graffiti. Following up on the problem, noted authors Graham Hancock and Robert Bauvalnicely did away with Vyse's scurrilous attempt to rewrite history by pointing out that not only were the hieroglyphs of dubious lineage, they were also misspelled! Furthermore, the manner in which Khufu's name was misspelled matched exactly a typo that appeared in the book on Egyptian hieroglyphics that Vyse had used for translation work.11 This dubious mark is hardly enough to determine absolutely the builder of perhaps the greatest artifact of the antediluvian world left on Earth. Nor will it dissuade us from discovering the Great Pyramid's true purpose. Dunn believes that the Great Pyramid was designed to be what is called a "coupled oscillator" with the Earth. A coupled oscillator is a device that is designed to allow the vibratory energy of one vibrating object to be picked up by a connected object so as to transfer the vibratory energy from the first object to the second object — in this case, from the Earth to the Great Pyramid. This is why the pyramid was not built upon a flat surface, but incorporates part of the Earth into its superstructure — the earth is effectively "coupled" with the Great Pyramid, allowing Earth's natural tectonic vibrations to easily pass into the pyramid. As Dunn explains, "Covering a large land area, the Great Pyramid is, in fact, in harmonic resonance with the vibration of the Earth — a structure that could act as an acoustical horn for collecting, channeling, and/or focusing terrestrial vibration. "12 And there are other aspects of the pyramid's construction that help make it an extremely efficient coupled oscillator. For one, the Great Pyramid integrates into its design the concept of pi, where the height of the pyramid is the same as the ratio between the radius of a circle and its circumference. Just as 2 x pi x the radius of a circle = its circumference, so too 2 x pi x the height of the pyramid = its circumference. As such, like the Earth, (and all spheres) the Great Pyramid integrates into its structure the concept of pi, which helps it resonate with Earth's energy. Other aspects include the relative placement of the pyramid in the approximate center of Earth's land masses, its placement at precisely at 30 degrees north latitude, and many other interesting facts and figures that lend great weight to Dunn's theory too numerous to get into here. The Subterranean Chamber (C) was originally built as a method of converting transverse and longitudinal seismic waves into sound energy of a very low frequency — in effect, it was a subterranean "subwoofer". "The Pit" (C2) was actually one part of this subwoofer that converted transverse waves into sub-bass sounds (the dotted area indicates Vyse's ill-fated attempt to find hidden treasure), and the Dead-End Passage (C1) was originally designed to convert longitudinal waves into subbass, or possibly slightly higher frequency bass sounds than the pit. The size and configuration of the pit and the passage would actually determine the type of sound that would be created, meaning that each had been effectively "tuned" to generate a certain sound whenever they were hit with seismic energy, effectively making the Subterranean Chamber a massive subwoofer. The small alcove (C3)outside of the main chamber may have been intended to help regulate the amplitude of the sound, acting as a "limiter" to keep it from getting too loud before it was piped up the descending passage and and "Well-Shaft"(F) to the Grand Gallery. Seismic energy takes the form of two basic waveforms while underground: transverse waves, and longitudinal waves. Transverse waves, also known as primary or compressional "P" waves, cause particles to oscillate parallel to the direction that the wave is traveling. Longitudinal waves, however, cause particles to oscillate perpendicular to the direction that the wave is traveling. So, in order to capture the energy from both types of waves, you would need to create two resonance chambers that are specially configured to capture and convert these two different types of energies — one vertically oriented, and one horizontally oriented — which is exactly how the sub-chambers that are found in the Subterranean Chamber complex are configured. Motivated by the theory that the Grand Gallery had been built with an acoustical use in mind, Dunn set about testing its acoustical properties. 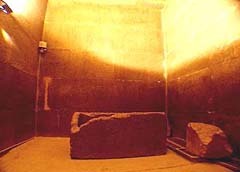 Predictably, acoustic experiments undertaken by Dunn and his colleagues showed that Grand Gallery was indeed an acoustical resonating chamber that was specifically designed to reflect all sound that was emitted anywhere in the Great Pyramid — including the Subterranean Subwoofer — into the King's Chamber. The tiles on the ceiling, as well as the missing tiles on the floor, all acted to bounce sound back towards the King's Chamber. 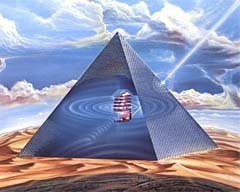 Based upon Dunn's research, then, it appears that the "earth power" that was used to power the Giza Power Plant came in the form of seismic energy that was converted to sound through highly sophisticated architectural and musical means. This sound was carefully tuned so as to generate an F-Sharp chord, which, acoustically concentrated in the King's Chamber, caused the granite walls, floor, ceiling and sarcophagus in the King's Chamber to resonate. 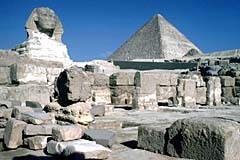 The quartz crystals that make up 50% of the structure of granite resonate at certain frequencies, and when they resonate they generate a form of electricity calledpiezoelectricity, so when the pyramid was in full swing, the entire King's Chamber must have contained a tremendous amount of electrical energy, ready to be put to use. The second element that Dunn proposes was necessary for the Giza Power Plant was hydrogen. He believes that the two shafts (B1 & B2) that lead to the so-called "Queen's Chamber" (B) were once used to feed hydrated zinc chloride and hydrochloric acid into the Queen's Chamber in order to provoke a chemical reaction that would result in the creation of pure hydrogen. He came to this conclusion due to the fact that the entire Queen's Chamber — walls, ceiling and floor, as well as the passageway that led to it — had been and still is covered in 1/2 inch of a salty material that is a combination of calcium carbonate (limestone), sodium chlorite (salt) and calcium sulfate (gypsum). Some have speculated that this salty substance was a leftover from the Great Flood, which would have indeed flooded the Great Pyramid for a time if the tsunami had reached that far. However, they forget that the rest of the pyramid is salt-free, which negates that possibility. In fact, the only possible way that the walls, ceiling and floor of the Queen's Chamber could have been covered was if the salt had been deposited as a result of hot hydrogen reacting with the limestone walls. There is no other possible way, as the salty residue on the limestone walls could only have occurred as a result of a unique chemical reaction that can only be caused by hot hydrogen gas reacting with limestone. But by what means were the zinc chloride and hydrochloric acid piped into the Queen's Chamber and mixed? The answer is in fact very simple: the mysterious shafts that were found by the stonemasonWayneman Dixon in 1872. Dixon, when searching the walls of the Queen's Chamber for clues leading to other secret tunnels or chambers, chanced upon a couple of thin slits in the northern and southern walls of the Queen's Chamber. 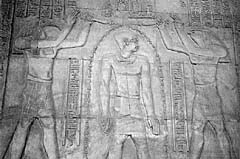 He set at the slits with hammer and chisel, and found that they were slits in a thin covering for two long shafts that were approximately 7" square and went far into the body of the pyramid. The "Queen's Chamber", which Christopher Dunn has demonstrated was more likely a chemical reaction chamber wherein hydrated zinc chloride and hydrochloric acid were combined to create hydrogen. Evidence for such a reaction exists all over the walls, and ceiling of the chamber, in the form of sodium chlorite, which would only have formed as a result of a chemical reaction between hot hydrogen gas and the limestone walls of the chamber. Thus, a more likely name for it should be "the Hydrogen Reactor". The hydrated zinc chloride and hydrochloric acid were piped in through the northern and southern shafts, (B1 & B2)their flow controlled by various regulators (B3)discussed at length by Dunn in The Giza Power Plant. Another possibility discussed by Mehler in The Land of Osiris is that the Egyptians had mastered the technique of mixing hot and cold water (B1 & B2) in such a way as to convert the water into hydrogen and oxygen in what he calls an "implosion reaction", the process perhaps initiated by some sort of apparatus that was once located in the niche in the Queen's Chamber (B3). But sound and hydrogen were only part of the equation. Dunn believes that an additional force was brought in in order to generate what modern science calls a MASER — Microwave Amplification through Stimulated Emission of Radiation. MASERs — a form of laser that utilizes microwaves as its power source, and hydrogen as its medium — can be produced by modern science with relative ease. But how on Earth, assuming the technological level of the antediluvian Egyptians was adequate to the task, could the Great Pyramid have been designed so as to capture or generate microwave energy? Another anomaly of the Great Pyramid that rarely gets any attention is the fact that the outer faces are slightly concave — not easily noticeable, but definitely a distinct architectural feature that must have been intentional. Many have speculated on the reason, but none had come up with a logical answer — until now. In order to create a MASER, one would have to create an environment of stimulated hydrogen, and then pass a directed beam of microwave energy through that medium, the result being a powerful beam of light with a great deal of energy. We have already determined that there was an environment of stimulated hydrogen in the King's Chamber, but how does the microwave radiation become introduced? Are there shafts in the King's Chamber like those in the Hydrogen Reactor, that could have been used to introduce radiation into the King's Chamber? In fact, like the Hydrogen Reactor, the King's Chamber — which we shall henceforth refer to as the "Power Center" — also has two shafts in its northern and southern walls. However, unlike the Hydrogen Reactor's shafts, which had been narrowed to slits purposely to help meter the amount of liquid that came through them, the Power Center's shafts were wide open. Also unlike the Hydrogen Reactor's shafts, the Power Center's shafts reached all the way to the outside of the pyramid. And therein lies our answer. The bright white casing stones would make an ideal reflector for both light and cosmic rays that hit Earth 24 hours a day. Yet our modern reflector telescopes have to be concave, curved like a dish, in order to reflect the light into a central focal point that then captures the radiation. Most people don't realize this, but the Great Pyramid is actually concave on all four sides — the only pyramid in the world that it like this. 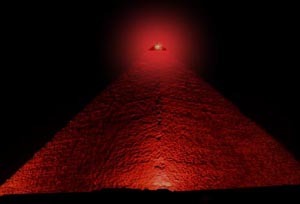 As such, Dunn argues, the Great Pyramid likely had collectors on its northern and southern faces that collected the solar energy by day, and the lunar energy — radiation from space, including reflected solar light off the lunar surface, and various other types of background radiation including microwaves — by night. Once again, Dunn had found the solution, and the concept of the Giza Power Plant was born. I differ here with Dunn on a couple of different points. First, I believe that both the northern and southern shafts were used to collect solar and lunar energy (as discussed previously), both of which fed into the Power Center, rather than energy entering one shaft and leaving another. 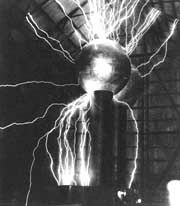 Second, I believe that, instead of a MASER, the Power Center instead contained some kind of object that absorbed and transformed the enormous amounts of energy in the Power Center into a non-linear form that could be easily transmitted through the any medium with little or no attenuation whatsoever — like a Tesla Tower. 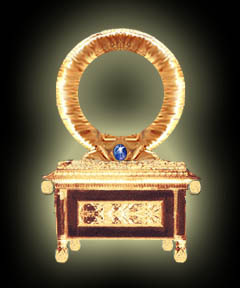 This object was likely a large, specially designed quartz crystal or, as some have theorized, a device similar in size and function to the Ark of the Covenant that contained crystals. Fueling the latter theory is the fact that the Ark as described in the Book of Exodus would have fit nearly perfectly inside the granite sarcophagus. Moreover, Jewish tradition makes it clear that thetwo tablets of the Ten Commandments had been made of sapphire, a blue, transparent form of corundum that is crystalline in structure. — Barring some new revelation, we will assume that this is indeed the answer — that inside the granite sarcophagus inside the Great Pyramid was once an antediluvian version of the Ark of the Covenant. Cayce believed that the world before the Flood knew electricity, radio, television, nuclear power and even a currently unknown form of power that was based on crystals, tectonic "earth" power, and "cosmic rays", or electromagnetic radiation — including microwave radiation — that we now know regularly bathes the earth from space. He also identified two groups of people, one good and one evil, whom he described as the sons of the Law of One and the sons of Belial, respectively. 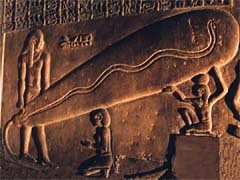 The sons of the Law of One had developed technology using earth energy, solar energy, lunar energy and crystals to use for man's benefit, whereas the sons of Belial — who are probably the wicked giants mentioned in the Bible and elsewhere — twisted that technology to use as a powerful weapon that they had tried to use to conquer the world. 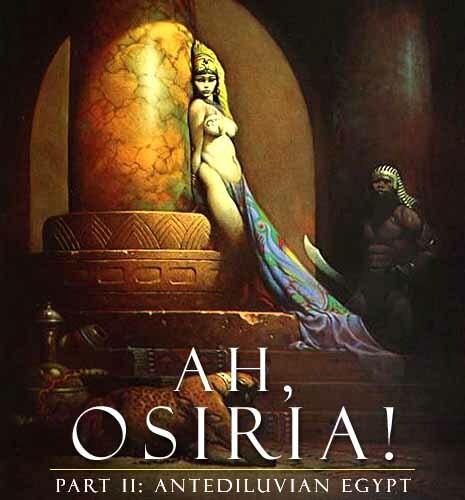 In Cayce's visions, he describes the technology of the antediluvian world and how the sons of Belial had twisted it towards evil: "In Atlantean land at the time of withdrawing from the Law of One — establishment of Sons of Belial — [the entity] was a priestess in temple built in opposition to the Sons of the Law of One — during time when there was the creating of the high influence of radial activity from rays of the sun that were turned on crystals in the pits that made connections with internal influences of the Earth. "18 This, of course, is a perfect description of our new paradigm of the Great Pyramid of Giza as a power plant — the "rays of the sun" were channeled into the Power Center, where their power was greatly magnified by the crystals in the antediluvian Ark. Moreover, "internal influences of the Earth", seismic activity, were turned by the Great Pyramid into sound energy, which was channeled into the power center to generate huge amounts of electrical power. 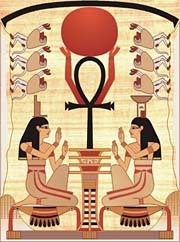 But perhaps the most important part of this vision is the fact that Cayce had been seeing through the eyes of a priestess of the wicked Belial faction that had built a temple like the Great Pyramid that they intended to use not as an inexhaustable supply of energy, but as a terrible weapon. In the right hands, the Giza Power Plant was a tremendously beneficial asset to humanity. With relatively little effort, the Giza Power Plant — and others like it worldwide — provided humanity with almost unlimited free energy. And so, according to Cayce, for thousands of years the world was at peace, under the benevolent rule of the Children of the Law of One. However, the time came when the sons of Belial had gained the upper hand, and had turned the Giza Power Plant into a dreadful weapon: The Giza Death Star. As we saw in Part III in our series on Atlantis, the sons of Belial had destroyed most of Atlantis in a series of cataclysms that they had brought on themselves in their attempts to conquer the world. Though Cayce's description of how they had managed to sink the islands of Atlantis by their own actions is not clear, in the context of the Giza Death Star paradigm we can begin to see how this might have been accomplished. Essentially the sons of Belial had greatly ramped up the amount of power that could be output through the various power plants around the world by setting off explosions underground — nuclear explosions. 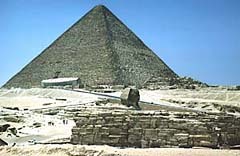 As a result, the power output of the power plants such as the one at Giza were, for a short time, hugely increased as the seismic energy released by the nuclear weapon violently shook the pyramid. Unfortunately for the sons of Belial, these explosions also set off massive seismic disturbances which had the effect of sinking the island on which they were situated. In short, the Giza Death Star was the ultimate weapon. Using the other two pyramids of the Giza complex to "aim" the energy, the antediluvian Egyptians could literally cause a nuclear explosion anywhere on Earth. Moreover, assuming that the weapon was indeed scalar in nature, as Tesla's experiments were, the energy would not travel line of sight, like a missile to a target, but would simply appear at the target instantaneously, causing a nuclear explosion, with no warning, and no possible defense — truly the ultimate weapon. 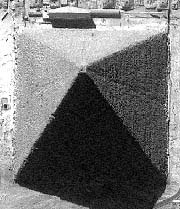 If this is true, then it is no wonder that excavation in the Great Pyramid has been so severely restricted in recent years — it may well be that the Great Pyramid is the most powerful weapon ever made, of a technology that, if it fell into the wrong hands, could tip the balance of power so radically in favor of those who controlled it, that they could easily rule the world. The Great Pyramid was too complicated to have been thought of by man. It's dimensions, internal configuration and geometry speak loudly about the distinct possibility that its blueprint had been stolen from heaven itself, that in its near-flawless perfection it somehow resonates with higher realities, which may ultimately be the true source of its limitless power — power in the world before the Flood to create limitless energy, and power in modern times to create limitless fascination. Perhaps someday we will fully understand its purpose, but that understanding may come at a price, as we see the technology that was used to build the Great Pyramid misused once again in an attempt to conquer the world. Until that time, we must be satisfied with the endless mystery that is Egypt. There is no shortage of ancient temples to explore, ruins whose origin and cause of destruction we can ponder, and mummies of ancient rulers whose thoughts and dreams we can only imagine. One thing appears to be becoming increasingly clear, however: ancient Egypt's most ancient history is not as it appears at first glance. 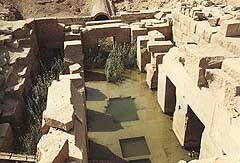 The Egyptians of the dynastic period may not have founded Egypt, but merely rebuilt over and imitated the ruins of a much older civilization that existed there in the world before the Flood. Not knowing the true meaning of the fragments of history and technology that they had found in the aftermath of the antediluvian war and the Great Flood, they could not duplicate, merely imitate. Thus the pyramids that were built in the image of the Giza perfection looked like the Great Pyramid, but they were as dead inside as the Pharaohs that were buried in them. Perhaps someday mainstream Egyptology will accept the megalithic temples and structures such as the Great Pyramid for what they are — relics of the the world before the Flood — instead of what they want them to be. Until that time, we must continue searching on our own for the dream that was antediluvian Egypt. 1 David Hatcher Childress, Lost Cities of Atlantis, Ancient Europe & the Mediterranean(Stelle, IL: Adventures Unlimited Press, 1996), 27. 3 Gary Fletcher, "The Osireion" (Ancient Civilizations - Tracing the Past:http://www.users.bigpond.com/MSN/gary_fletcher/). 4 David Hatcher Childress, Technology of the Gods: The Incredible Sciences of the Ancients(Kempton, IL: Adventures Unlimited Press, 2000), 11-12.